My Goddaughter is a little sweetheart. I try to write her as often as I can, send her pictures and little things. K writes to her Godsister every couple of weeks and really enjoys drawing pictures for her and telling her about her life and times. 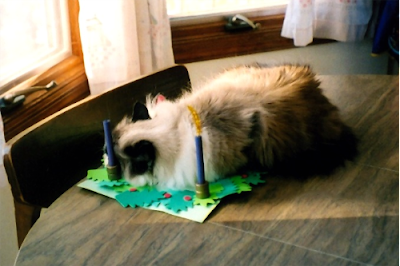 For Christmas we wanted to send her an advent wreath kit. 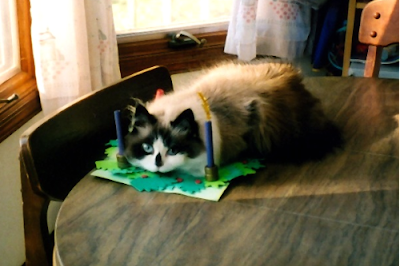 K made one from Oriental Trading company last year and we all loved it, especially our cat. So we got out the fun foam and dowel rods and came up with a reasonable facsimile. I'll send it tomorrow so she can make it next weekend. Hope, Love, Joy and Peace. And a nap in the sun. What more could you want. Stuck in a cast... Make something!